DUBAI, February 14, 2019 — There is no better way to express one’s love than through the act of giving. We all have family, friends and partners who mean a great deal to us and deserve to be treated. This Valentine’s Day, why not impress your loved ones and show your affection by cooking the perfect feast? The growing presence of online food delivery platforms indicates consumer desire for greater convenience. From the mere use of a smartphone, you can now have everything from your favorite fast food treat, to a gourmet three-course meal delivered right to your door. For cooking enthusiasts with busy schedules, there is also the ability to order healthy meal kits online. What is clear is that consumers are enjoying more meals in the comfort of their own homes. As a result, kitchen appliances should be able to handle a range of eating preferences and offer consumers greater flexibility – eating how and when they want. LG’s smart technology offers users an all-in-one solution to make dining simpler. 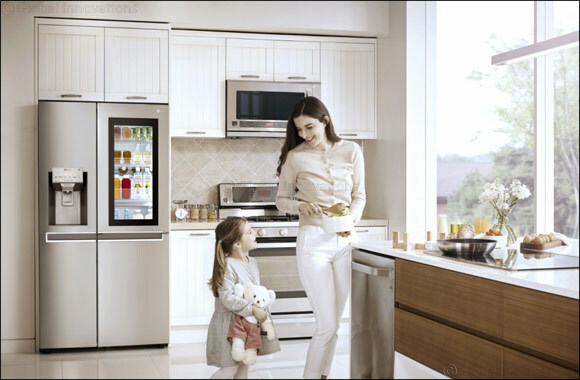 LG InstaView refrigerators come with Door-in-Door technology. Just knock twice, see what’s in your fridge and plan your meals, without losing your cool. InstaView refrigerators are designed to make home cleaning possible in no time. Hygiene FRESH+ automatically cleans and purifies the air using a five-stage filtering system, ensuring food is kept fresher for longer. Even leftovers can be kept in good condition for you to add to the next meal. So get creative and see how you can reinvent your classic dishes with a new twist. If you’re stuck for choice, why not seek advice from your new kitchen companion? InstaView refrigerators can recommend recipes based on the contents of your fridge and even communicate with LG ovens to set the right temperature and function settings. Spend less time monitoring your food and more time relaxing with your nearest and dearest. Use LG’s appliances to ensure a seamless cooking experience that will make a lasting impression this Valentine’s Day and for years to come.